Venice is notorious for being an expensive place to visit, and food and drink will probably be among your principal expenses. If you don't know where to eat, or what to pay, the chances are that you'll be ripped off. On our page about budget travel: Free things to do, we suggest that budget travellers cut back on food expenditure, as in Venice it can be one of your least rewarding outgoings. But if you aren't on a really tight budget, you can eat well in the town by following our advice. Here we'll take a look at the different types of food and drink establishment, to help you navigate through the tourist traps and understand the choices available. You can actually enjoy decent food and good wine without spending a huge amount; we'll give you tips on where and how. Eating a full meal in a restaurant is the most expensive food option. Although Venice is not renowned for its cuisine, it is infamous for its prices - horror stories abound of unwary tourists being charged hundreds of euros for dinner. But few travellers would really want to miss one of their most important holiday experiences: a good meal out, enjoying local food in nice surroundings. At the very least, an evening meal represents an opportunity to refuel while resting after a long day trekking around the monuments. So for Venice, the key is to be prepared. Avoid the pitfalls by taking a list of decent restaurants - we have a printable page of recommendations - and know what you're looking for. There are a number of words for restaurant in Italy. Ristorante generally indicates a more upmarket establishment with some pretensions, while a trattoria is a more humble, traditional eatery serving local people with simple filling dishes. Food served in a ristorante or trattoria will follow a traditional Italian pattern based around pasta, meat and seafood dishes (see our eating out page for more information on Italian meals). A pizzeria serves pizzas; not a speciality in Venice although there are one or two decent places. In Venice they usually have a brief non-pizza menu as well. An osteria (or ostaria) is similar to a trattoria, but with a slant towards drinking: instead of a full multi-course meal, you might have some wine along with a plate of food or a lighter snack. Don't go purely by name, though, as nowadays there is a lot of blurring of definitions. A place describing itself as an osteria might turn out to be a smart nouveau restaurant or an upmarket wine/food bar. Like the osteria a Venetian bacaro offers a chance to eat hot filling food in a less formal context; just a dish instead of a full meal. The busy Venetians frequently eat quickly and lightly, selecting snacks (cicheti) from a display at the bar, then eating them standing or seated on stools. An enoteca is a wine bar, which will usually have a good range of wines by the bottle or glass and some snacks, or possibly light meals. There are a few American-style fast food outlets in Venice. We think it would be desperately sad to resort to them, so we're not going to publish their addresses. At the very least, try the Italian version where you can get a big slice of pizza with your fizzy drink, instead of a burger. For fast food in a really Italian style, you can visit one of the city's take-away pizza shops. A hot slice of pizza costs around €2, and this is a good cheap way to have lunch on the move. In the more 'local' pizza shops, if you want a whole pizza, staff will prepare one while you wait. If you ask for a slice or a pizza 'da portare via' they'll wrap it up or put it in a box for you. Two of our favourite take-away pizza places are Algiubagio in Cannaregio by the Fondamente Nove vaporetto stop (a few doors along from the restaurant of the same name) and a small take-away in Campo Santa Margherita, Dorsoduro (called Pizza al Volo - you can spot it by the munching customers outside). For a cheap sit-down meal, see our restaurants page for details of Brek, a cheap self-service restaurant near the railway station. 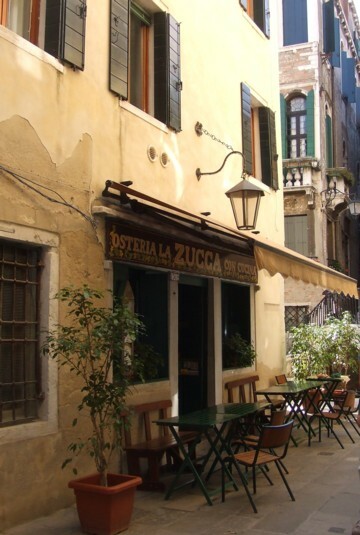 Bars and cafes have a very important function in Italian (and Venetian) society. 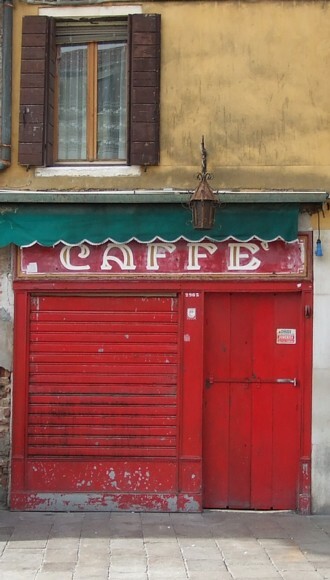 The words are fairly interchangeable: anywhere called a bar or caffè will serve you hot drinks, soft drinks and alcohol. Some of Venice's bars open at 8am and don't close until 2am. In that time they'll have served breakfast coffee and croissant to workers, refreshments to tired tourists, rolls and snacks at lunchtime, pre-dinner aperitivi to Venetians, and late-night drinks to tourists and students. Some cafes are more focussed on their daytime clientele and will close during the early evening, while others will have trendy fittings and be more of an alcoholic rendezvous. This generally becomes apparent once you've looked at a few; but you'll find that whatever kind is open can serve you what you require. Most bars sell a selection of rolls and sandwiches, some of which can be heated up for you. These are usually displayed in a glass cabinet or under the bar so you can take a look and see what you fancy. Some bars serve more complete meals, with hot toasted bruschette topped with tomato, cheese or ham, or salads. These snacks are rarely wonderful, and aren't usually a bargain in themselves, but it's a quick and convenient way to eat and you avoid all the extra charges you'd pay in a restaurant. You can expect to pay from €3 to €5 for a heated roll. If you sit at the outdoor tables of a cafe, there is almost invariably waiter service, and you will pay a slightly higher price than if you choose to drink on your feet at the bar. Naturally, bars in busy picturesque tourist spots charge more than ones in more 'local' areas. Away from St. Mark's and the tourist traps, you can enjoy a glass of wine for €2 or €3 (or even less in a truly local cheap spot) while sitting at a table and soaking up the atmosphere. An aperitivo (pre-dinner drink) in Italy is generally served with (free) snacks; in Venice this is usually just a bowl of crisps. Many bars don't have menus on display; although smart wine-bars will list their wines with pride. The cheapest thing to drink will be the house wine - just ask for red (vino rosso) or white (vino bianco). Sparkling Prosecco, a regional wine, is one of the most popular drinks here and is also cheap. Locals adore their spritz, a strong orange-coloured cocktail which comes in various versions but is generally very bitter. A pasticceria is a shop selling sweet pastries and cakes. Italians take little trays of miniature cakes, cream puffs, fruit tarts etc with them to dinner parties, rather than wine. Really fancy goodies can be expensive, but most shops also sell small slices of things like chocolate cake and apple tarts which make a nice snack or an addition to a picnic meal. In Venice a pasticceria sometimes doubles as a small bar, where you might stand with a coffee or hot chocolate while munching a cake and chatting to your neighbourhood acquaintances. The Rialto market is a good place to stock up on fruit and salad. You could buy rolls and cheese/meat slices from a supermarket, but anotherr option is to find a shop that will prepare filled rolls for you. Ask your hotel receptionist if there is such a place near you. You're looking for an alimentari, a shop which will usually have cheeses and meats displayed under a counter, rolls in a basket at the back, and a tell-tale chopping/bread board on the counter. I usually leave it to the shop assistant to recommend a good cheese. These shops won't make up anything especially fancy, but for a roll with excellent cheese, ham or both, it's a good cheap way to eat. You pay for the ingredients, so a cheese roll may cost only €2 or less. I like this method of preparing for a day trip or an excursion to the islands. The public water taps throughout Venice, as in the rest of Italy, are drinking water and it's perfectly safe, as well as free, to fill up your water bottle from them. Don't be scared into spending money on over-priced mineral water. Be aware, though, that there are strict rules about picnicking in Venice, and you'll be moved on if you try to eat in a busy tourist spot, on a bridge (a cardinal sin) or anywhere near St. Mark's. Head to a little park or an out-of-the-way bench. You sometimes see tourists sitting by the canals drinking from their own wine bottles. They probably feel smug that they've not been ripped off. However, the chances are they've paid just as much for their bottle as you will pay sitting elegantly at a comfortable table, admiring the view and participating in the city's life. Foreign 'alcoholism' is frowned on even in Venice, where locals certainly drink more than other Italians, so swigging from a bottle on a bridge or outside someone's home is seen as most uncivilised. In a cheap bar you can get a glass of good wine for €2.